Georgia Institute of Technology/Emory University, 2004. Research Interests: Developing targeted imaging and therapeutic agents designed to improve the detection and treatment of cancer. 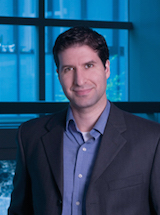 Specific research interests include (i) developing new nanoformulations that are capable of carrying extremely high payloads of drugs, radiosensitizing agents, and/or contrast agents; (ii) investigating new targeting strategies that maximize specificity and sensitivity; and (iii) developing new bioconjugation techniques that enable the highly efficient, site-specific labeling of antibodies and other targeting ligands and that allow for the rapid production of bispecific antibodies..
Keywords: Molecular imaging, probes, contrast agents, magnetic resonance, fluorescence, bioluminescence, protein engineering, antibody conjugates, bispecific antibodies. Thawani Jayesh P, Amirshaghaghi Ahmad, Yan Lesan, Stein Joel M, Liu Jessica, Tsourkas Andrew: Photoacoustic-Guided Surgery with Indocyanine Green-Coated Superparamagnetic Iron Oxide Nanoparticle Clusters. Small (Weinheim an der Bergstrasse, Germany) 13(37), Oct 2017. Kartha Sonia, Yan Lesan, Weisshaar Christine L, Ita Meagan E, Shuvaev Vladimir V, Muzykantov Vladimir R, Tsourkas Andrew, Winkelstein Beth A, Cheng Zhiliang: Superoxide Dismutase-Loaded Porous Polymersomes as Highly Efficient Antioxidants for Treating Neuropathic Pain. Advanced healthcare materials 6(17), Sep 2017. Yan Lesan, Miller Joann, Yuan Min, Liu Jessica F, Busch Theresa M, Tsourkas Andrew, Cheng Zhiliang: Improved Photodynamic Therapy Efficacy of Protoporphyrin IX-Loaded Polymeric Micelles Using Erlotinib Pretreatment. Biomacromolecules 18(6): 1836-1844, Jun 2017. Wang Hejia Henry, Altun Burcin, Nwe Kido, Tsourkas Andrew: Proximity-Based Sortase-Mediated Ligation. Angewandte Chemie (International ed. in English) 56(19): 5349-5352, May 2017. Karunamuni Roshan, Naha Pratap C, Lau Kristen C, Al-Zaki Ajlan, Popov Anatoliy V, Delikatny Edward J, Tsourkas Andrew, Cormode David P, Maidment Andrew D A: Development of silica-encapsulated silver nanoparticles as contrast agents intended for dual-energy mammography. European radiology 26(9): 3301-9, Sep 2016. Nwe Kido, Huang Ching-Hui, Qu Feini, Warden-Rothman Robert, Zhang Clare Y, Mauck Robert L, Tsourkas Andrew: Cationic gadolinium chelate for magnetic resonance imaging of cartilaginous defects. Contrast media & molecular imaging 11(3): 229-35, May 2016. Sun Lova, Joh Daniel Y, Al-Zaki Ajlan, Stangl Melissa, Murty Surya, Davis James J, Baumann Brian C, Alonso-Basanta Michelle, Kaol Gary D, Tsourkas Andrew, Dorsey Jay F: Theranostic Application of Mixed Gold and Superparamagnetic Iron Oxide Nanoparticle Micelles in Glioblastoma Multiforme. Journal of biomedical nanotechnology 12(2): 347-56, Feb 2016. Al Zaki Ajlan, Hui James Z, Higbee Elizabeth, Tsourkas Andrew: Biodistribution, Clearance, and Toxicology of Polymeric Micelles Loaded with 0.9 or 5 nm Gold Nanoparticles. Journal of biomedical nanotechnology 11(10): 1836-46, Oct 2015. Hui James Z, Tamsen Shereen, Song Yang, Tsourkas Andrew: LASIC: Light Activated Site-Specific Conjugation of Native IgGs. Bioconjugate chemistry 26(8): 1456-60, Aug 2015. McQuade Casey, Al Zaki Ajlan, Desai Yaanik, Vido Michael, Sakhuja Timothy, Cheng Zhiliang, Hickey Robert J, Joh Daniel, Park So-Jung, Kao Gary, Dorsey Jay F, Tsourkas Andrew: A multifunctional nanoplatform for imaging, radiotherapy, and the prediction of therapeutic response. Small (Weinheim an der Bergstrasse, Germany) 11(7): 834-43, Feb 2015.